You can do almost anything on your smartphone. I’d be lost without mine since I use it for so many things in my life. One of the ways I use my phone is to handle my investing needs. 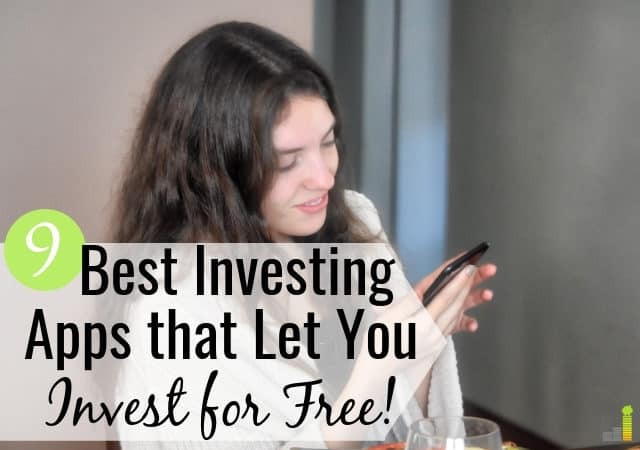 The best free investing apps let you manage much of your investing needs at your fingertips, at any point of the day from wherever you might be at the time. Many think investing in the stock market difficult. It really isn’t, especially if you handle it the right way. If you use your smartphone to manage different facets of your life, here are some of the best stock investment apps to manage your money. M1 Finance has become one of our favorite investing tools over the past year. The reason for that is quite simple – they let you invest for free. That’s right! No broker commissions or fees to manage your investing. M1 Finance is a quasi-robo-advisor. They help manage your investments for you (like Betterment or Wealthsimple), but they give you the power to customize your investment plan. When you open an account with M1 Finance, they help you determine your goal. Once you have your goal established, they have you create a “pie”. That pie holds each of your stock or ETF (exchange-traded fund) investments – it can be as few or as many as you want. You can also have multiple pies within your account. M1 Finance then manages the investing within each specific pie to ensure they’re appropriately allocated to stay in line with your goals. If you’d rather not create your own pie, M1 Finance has over 60 you can choose from. There are no charges or fees to do this, and the only cost you may incur is if you choose an ETF as they have management fees. Thankfully, most ETFs have very minimal management fees. If you want to start investing for free, M1 Finance is a great option. Investing in the stock market with little money is a challenge for many. Acorns gets rid of that problem by allowing you to invest with as little as $5. With Acorns, you simply invest your spare change. For example, if you spend $4.02 on a gallon of milk, it invests the remaining $.98 for you. Acorns is best for beginning investors who struggle to save or have minimal funds to start investing. Acorns allows you to invest in a selection of six different low-cost ETFs and provides access to a variety of educational resources to help with your investing. They’ve recently added to their platform, and now offer retirement accounts and a round-up multiplier to help you invest more money. These new additions makes Acorns one of the best free investment apps. Acorns typically charges $1 per month for accounts under $5,000, and a .25 percent annual charge after that. However, if you’re 24 years old or under and attend college, you can invest for free with Acorns. TD Ameritrade is one of the oldest online brokerages in this review. They offer a wide array of investment options from stocks and bonds to managed accounts. A forerunner in the free ETF space, TD Ameritrade also offers a list of just over 100 commission-free ETFs you can buy and sell for free. Not all of the ETFs are equal, but TD does offer a wide variety of options including some lower cost index funds. Beyond the commission-free ETFs, you can trade for $6.95 per trade, as well as enjoy a no minimum balance requirement to open an account. The TD Ameritrade app itself is one of the best investment apps as it offers numerous robust tools – from trading tools to research and education. It’s above average in terms of usability and is fairly user-friendly. Click here to open a TD Ameritrade account and start investing for free. What places E*Trade on our list of the top investing apps is the same as TD Ameritrade – they offer just over 100 commission-free ETFs you can buy or sell. Their list of ETFs is a bit more diverse than the one at TD, making them a bit better in my opinion. However, the E*Trade app is a bit more cumbersome and less easy to use than TD’s. It offers many of the same tools as the TD Ameritrade app, but is not as user-friendly. Outside of the commission-free ETFs, E*Trade charges $6.95 per trade and allows you to open IRAs with no minimum balance. Click here to open an E*Trade account and start investing for free. If you’d like to read more about E*Trade, here’s our E*Trade review. Robinhood is the only true stock trading app in our list. With Robinhood, you can place market trades as well as limit or stop trades for nothing. Yes, you read that right It’s free to use. If you simply want to buy and sell stocks, then Robinhood may be for you. However, if you like to trade actively, you may want to look at other stock trading apps. Robinhood is light when it comes to research tools. If you choose to use Robinhood to trade, you may want to pair it with other free investing tools to get the kind of research you want. Despite that drawback, Robinhood does allow for instant trading, up to $1,000, when you deposit funds. It also offers the ability not to have to wait on trades to settle to get access to your cash. Robinhood does offer a paid service, known as Robinhood Gold, that gives you access to things like after-hours trading or margin capability. WiseBanyan is a newer player in the robo-advisor space and offers free asset management. Because of its youth, the customization and tools are lacking with the WiseBanyan app. However, for someone wanting a simple, goals-based approach, they might make a good fit. If you’d like to learn more about WiseBanyan, here’s our WiseBanyan review. I love Vanguard. My wife and I do all of our investing with Vanguard because we love their low-cost, simple approach. Vanguard allows you to trade their ETFs for free, with no minimums. All you need is the ability to buy at least one share. What holds Vanguard back is their app. It looks its age and doesn’t provide the amount of tools I’d like to see. That being said, I’m willing to overlook it thanks to their philosophy. If you’d like to learn more about Vanguard, here’s our Vanguard review. Stash Invest is very similar to Acorns. You can invest with as little as $5, but they also give you access to a number of individual stocks. not just ETFs. Stash Invest is app-based only, and they provide a handful of resources to help you understand the basics of investing. What puts them as a runner-up is they’re only free for the first month; after that they charge $1 per month for accounts under $5,000 and .25 percent annually for accounts under $5,000. Fidelity is a legacy online broker, they have a lot of great tools and resources, and they offer 85 commission-free ETFs. You can also place other stock trades at $4.95 per order, which is a great value. However, there are some cons to the app. For instance, I’d like to see a lower entry price for non-IRA accounts (theirs is $2,500) and a bit more functionality. 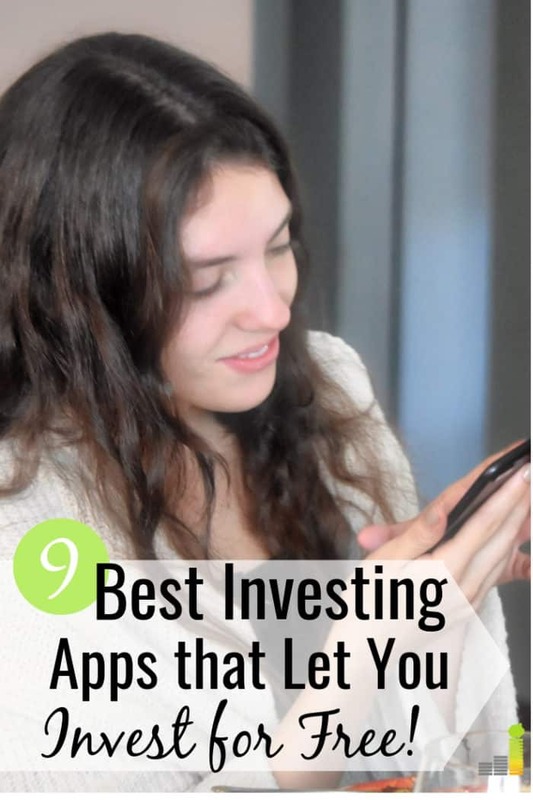 This would rank them higher among the best free investing apps. Invest in real estate: Investing in real estate is a great way to build wealth. Until recently, investing in real estate has only been available to those with means. Thanks to crowdsourcing, you can invest in real estate with little money. The two main options if you want to invest in real estate with little money are Fundrise and RealtyMogul. Both platforms let you invest in either commercial or residential real estate with limited funds. You can start investing with as little as $500, or $1,000, respectively. The fees with RealtyMogul are lower than Fundrise – .50 percent vs. 1 percent per year, though Fundrise is a bit more robust. If you want a way to diversify your investing, either are worth considering. Peer-to-Peer (P2P) lending: P2P lending has grown in popularity over the past few years. With P2P lending, you loan money to individuals who may need the funds to consolidate debt, remodel their home, or pay for moving expenses. You should expect returns in the six to eight percent range, which is competitive with stock returns. LendingClub is one of the top platforms in this space. You can open a non-IRA account with as little as $1,000 and can invest in loans with as little as $25. You must have $5,500 to open an IRA. Diversification in P2P lending is just as important as it is with investing in stocks. If you choose to take part in P2P lending, do your due diligence when investing in loans to protect your investments. Investing in the stock market, and many other investing options, is relatively simple. You don’t need a lot of money and can do well with a little education. Take advantage of one of the free investing apps above and start growing your money today. What are some of your favorite money management apps? When choosing a stock investing app, what characteristics are important? What have you done to start investing for free or cheap? I primarily use Fidelity. Why? Because it’s what my employer has for our benefits. It was just easier to have my individual account on the same app as my 401k and ESPP. Lots of good options in this list, though. You can’t argue with ease! Fidelity has a lot of great services so you could definitely do worse.